Laura Ferri has been involved in the promotion and study of Canadian culture and literature for several decades, formerly as cultural coordinator of the Siena-Toronto Centre, University of Siena, for over 20 years and Fellow of Woodsworth College, University of Toronto, as well as through her interests in translation. As a translator she has contributed to Italian publications of Stephen Cranes' short stories, of the poetry of Al Purdy, Margaret Atwood, Dennis Lee, Margaret Avison, Jane Urquhart, and more recently of the poems by Carl Sandburg, Chicago. In 1994, she completed the first Italian translation of Jessie Weston’s From Ritual to Romance. Among the novels she has translated into Italian there are André Alexis’ Childhood, Jane Urquhart’s The Stone Carvers and Mary Melfi’s Italy Revisited. Conversations with My Mother. Her publications as an editor include the collection Jane Urquhart Essays on Her Works, the Italian edition of Isabella Valancy Crawford’s Fairy Tales, a collection of Margaret Avison’s poems, the volume Reading Munro in Italy, co-edited with Francesca Balestra and Caterina Ricciardi, Views of Ice from Siena, co-edited with Luca Trabalzini, Moira Mini and Giada Quintavalle, the translation into Italian of Licia Canton's Almond Wine and Fertility, edited with Moira Mini, with the title Vino alla mandola e fertilità. She has published articles in Canadian and European literary journals such as Descant, Arachne, Italian Canadiana, Open Letter, Books in Canada, Nuovi Argomenti, Merope, Il Tolomeo, Englishes. Two of her articles appeared in the volumes Canada- Text and Territory (Cambridge Scholars Press) and in Bringing Landscape Home in the Writing of Jane Urquhart (Lodz University Press). Recently she has published "An Interview with Rosemary Sullivan, after she wrote Stalin's Daughter." 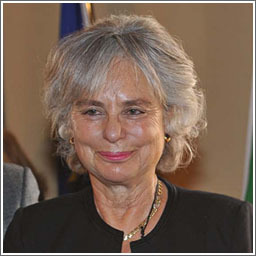 Her several articles on Alice Munro are quoted in the bibliography of the ‘Meridiano’ collection of Alice Munro’s short stories by Mondadori.